LANSING, MI — Michigan’s resident Canada goose population is doing just fine, and hunters will have a shot at them again come Sept. 1. In fact, they are likely to have more birds to shoot. Michigan’s Natural Resources Commission recently approved the state’s early goose season for 2012 as part of an early waterfowl hunting package of rules. The season will be Sept. 1-10 in the Upper Peninsula, Huron, Saginaw and Tuscola counties, and Sept. 1-15 in the rest of the state. “All indications are that the population is growing,” said Barb Avers, the waterfowl specialist for the Michigan Department of Natural Resources. 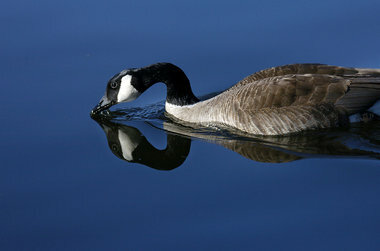 “The 2012 Michigan Canada goose population estimate is about 279,000. This is a 36 percent increase over 2011 and 30 percent above the long-term average (since 1991). The early goose season targets resident Canada Geese populations rather than migrants that arrive in Michigan later in the year. The resident geese are considered a nuisance due to their abundance in parks, golf-courses and agricultural lands. Approximately 84,000 resident geese were killed by 20,000 hunters during the 2010 early season, according to Avers. Hunters took about 200,000 during the early and regular goose seasons statewide. Along with approving season dates, the NRC also approved a new rule that requires hunters to use No. 1 shot or smaller if they want to hunt in Point Mouillee and Harsens Island State Game Areas. Hunters have been allowed to use larger, triple-B shot until this season. “We had a couple of incidents last year, and the Harsens Island and St. Clair Flats waterfowl groups came and asked if we could look at shot size,” said Joe Robison, the DNR’s wildlife supervisor for southeast Michigan. “One hunter had to go to the hospital after some shot penetrated his skin. This is going to improve the area and make hunting safer,” Robison said. Triple-B shot had been allowed for hunting geese, but most of the hunting at those two areas is for ducks, according to Avers, who said the small shot doesn’t travel as far. The concerns raised were due to the proximity of the hunting stations at the managed areas and the potential for the larger, heavier shot to travel farther and hurt someone. The NRC also approved a longer season for snipes and rails. The season will open Sept. 1 rather than Sept. 15. The daily bag limit was raised to 25 Sora or Virginia Rails per day, up from eight per day. Hunters will be allowed to have 50 in possession. Avers said the season was extended to provide additional hunting opportunity. This entry was posted in Uncategorized and tagged Canada Geese, DNR, Hunting, Waterfowl. Bookmark the permalink.